1. What are biogeochemical cycles? The main biogeochemical cycles studied in ecology are the water cycle, the carbon cycle and the nitrogen cycle. 2. What is the importance of water, carbon and nitrogen for living organisms? Water is the main solvent for living organisms and it is necessary for almost all biochemical reactions, including as reagent of photosynthesis. Many properties of water are very important for life. Carbon is the main chemical element of organic molecules; carbon dioxide is also reagent of photosynthesis and a product of the energy metabolism of living organisms. Nitrogen is a fundamental chemical element of amino acids, the building blocks of proteins that are in turn the main functional molecules of living organisms; nitrogen is also part of nucleic acid molecules, which are the basis for reproduction, heredity and protein synthesis. 3. What is the water cycle? Liquid water on the planet's surface is heated by the sun and turns into water vapor, which enters the atmosphere. In the atmosphere, large volumes of water vapor form clouds that, when cooled, precipitate liquid water as rain. Therefore, water comes back to the planet surface and the cycle is complete. During possible steps of the cycle, water may still be stored in subterranean reserves or in the form of ice in mountains and oceans, and may also be used in the metabolism of living organisms, incorporated into the body of individuals or excreted through urine, feces and sweat. 4. Why is the sun the “motor” of the water cycle? The sun can be considered the motor of the water cycle because the transformation of liquid water into water vapor depends on its energy. Therefore, the sun is the energy source that causes water to circulate in nature. 5. 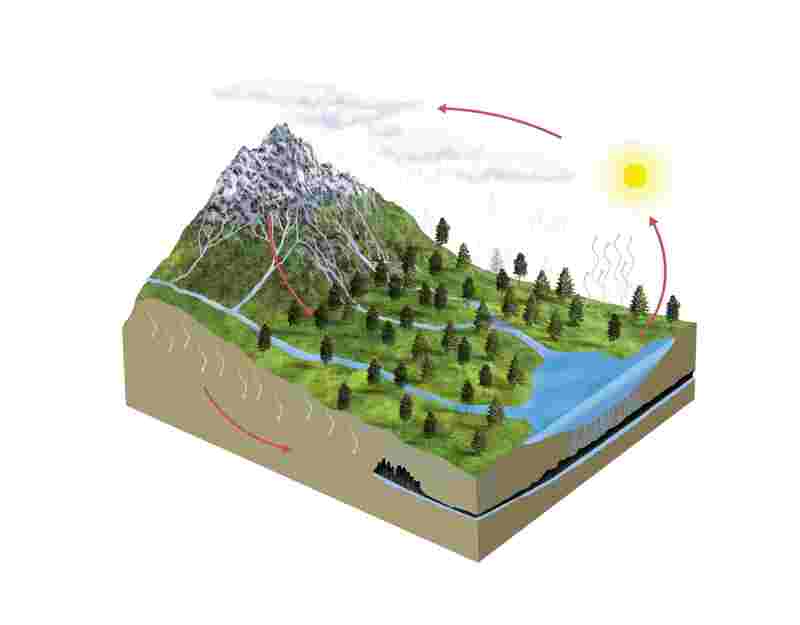 What is the carbon cycle? The carbon cycle represents the circulation and recycling of the chemical element carbon in nature as a result of the effect of living organisms. Photosynthetic organisms absorb carbon as carbon dioxide available in the atmosphere and the carbon atoms become part of glucose molecules. During the cellular respiration of these organisms, part of this organic material is consumed to generate ATP and, in this process, carbon dioxide is returned to the atmosphere. The other part is incorporated by the photosynthetic organisms into the molecules that compose their structure. The carbon atoms incorporated into the producers are transferred to the next trophic level and again a portion of them is released by cellular respiration in consumers, another part becomes a component of the consumer's body, and the last part is excreted as uric acid or urea (excretions later recycled by decomposer bacteria). Therefore, carbon absorbed by producers via photosynthesis returns to the atmosphere through cellular respiration along the food chain until reaching the decomposers that also release carbon dioxide in their energy metabolism. Under special conditions, through a process that takes millions of years, carbon incorporated into organisms may also constitute fossil fuels stored in deposits under the surface of the planet; as fossil fuels burn. the carbon atoms return to the atmosphere as carbon dioxide or carbon monoxide. The burning of vegetable fuels, such as wood, also returns carbon to the atmosphere. 6. What is the main biological process that consumes carbon dioxide? 7. How is carbon dioxide made by producers and consumers? 8. What are fossil fuels? Fossil fuels, such as oil, gas and coal, form when organic material is preserved from the complete effect of decomposers, generally buried deep and under pressure over millions of years. Under such conditions, the organic material transforms into hydrocarbon fuels. Fossil fuels are a natural reservoir of carbon. When oxygen is present, these fuels can be burned and carbon dioxide and carbon monoxide are released into the atmosphere. 9. What is the most abundant form in which nitrogen is found in nature? The most abundant nitrogen-containing molecule found in nature is molecular nitrogen (N₂). The air is 80% composed of molecular nitrogen. 10. In which form is nitrogen fixed by living organisms? Most living organisms cannot use molecular nitrogen to obtain nitrogen atoms. Producers fix nitrogen mainly from nitrate (NO₃⁻). Some plants also fix nitrogen from ammonia. Consumers and decomposers acquire nitrogen through digestion of proteins and nucleic acids from the body of other living organisms. 11. What is the nitrogen cycle? The nitrogen cycle represents the circulation and recycling of the chemical element nitrogen in nature. The nitrogen cycle basically depends on the effect of specialized bacteria. Bacteria in the soil called nitrogen-fixing bacteria present in plant roots absorb molecular nitrogen from the air and release nitrogen in the form of ammonia. The decomposition of organic material also produces ammonia. In the soil and roots (mainly of leguminous plants), a first group of chemosynthetic bacteria called nitrifying bacteria or nitrosomonas produces energy by consuming ammonia and releasing nitrite (NO₂). The second group of nitrifying bacteria, called nitrobacteria, uses nitrite in chemosynthesis, releasing nitrate (NO₃). In the form of nitrate, nitrogen is then incorporated by plants to be used a component of proteins and nucleic acids, and the element then follows along the food chain. Nitrogen returns to the atmosphere through the effect of denitrifying bacteria that use nitrogen-containing compounds from the soil and release nitrogen gas (molecular nitrogen). 12. Why is leguminous crop rotation used in agriculture? Leguminous crop rotation and other types of crop rotation are used in agriculture because many bacteria important for the nitrogen cycle live in these plants. Leguminous crop rotation (or conjointly with the main crop) helps the soil to become rich in nitrates, which are then absorbed by the plants. Green manure, the covering of the soil with grass and leguminous plants, is also a way to improve the fixation of nitrogen and is an option for avoiding chemical fertilizers. Study the next subject: go to Biodiversity.